At our meeting yesterday the party decided to focus for the next few weeks on fighting the TPPA. This is a secret agreement being negotiated by 11 Pacific rim nations. Our negotiators are in Foreign Affairs and Trade and our Minister of Trade Tim Groser has stated that the negotiations will remain secret and he has not seen the text of the agreement. Pharmac is under threat, genetic modification may come in, you won't be able to harm banks or they will sue our government for millions. There now appears to be just one main website informing us about this secret agreement, http://itsourfuture.org.nz. It has a wealth of materials on their sites. The reason we decided to focus on TPPA was that if this agreement was signed, almost all the measures we want to take to protect New Zealand from financial contagion would be illegal. Our government would be sued by multinationals for millions. We urge our members to inform themselves through this site. Our first action will be to attend the panel to be held in Wellington at Downstage Theatre 1-4.30pm. Seems it is booked out when I booked! Hope they get a bigger venue. 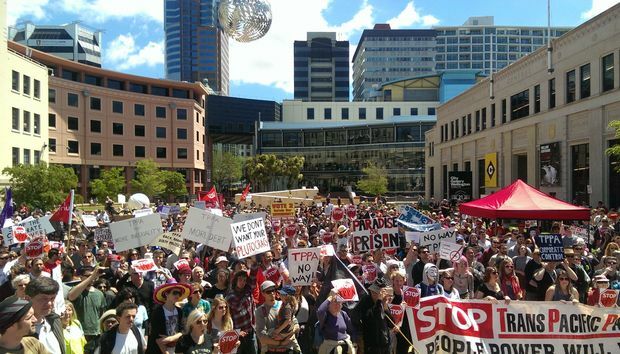 Why not join the Facebook group fighting TPPA and help? I found this excellent little video there.